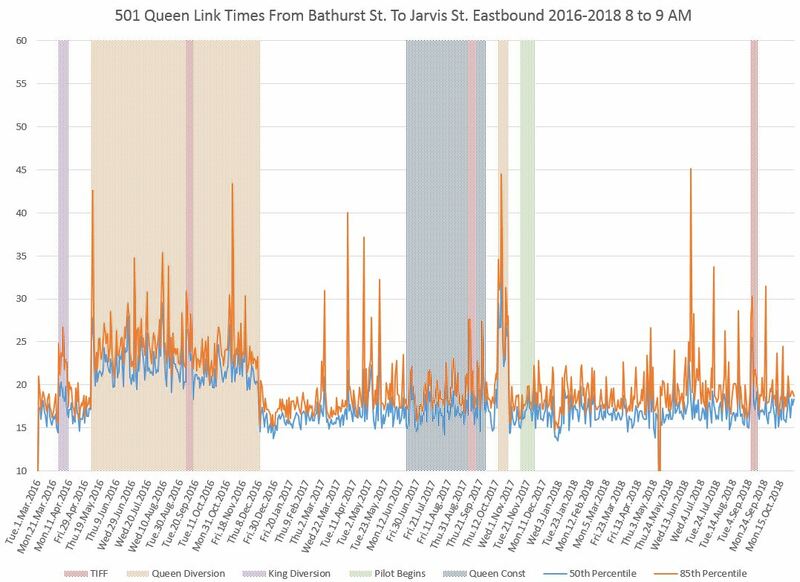 This is the second part of the November 2018 update of data from the King Street Pilot. 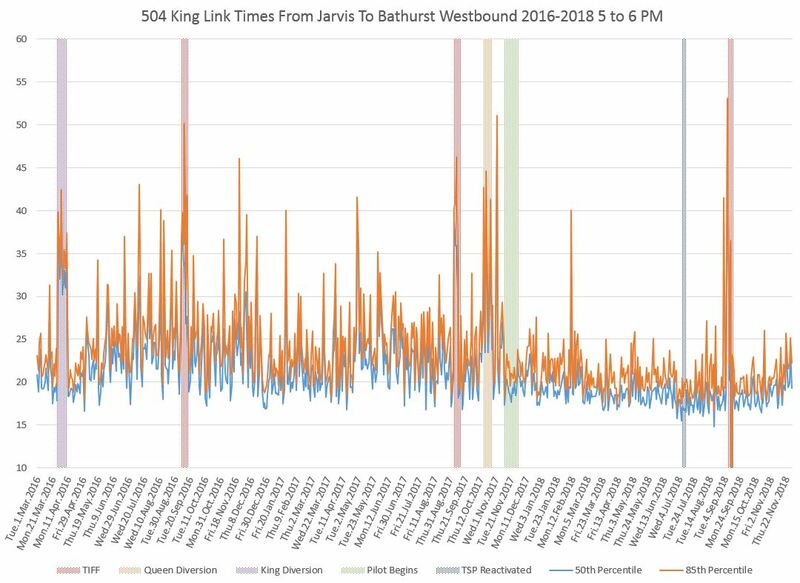 Part I dealt with travel times and line capacity. 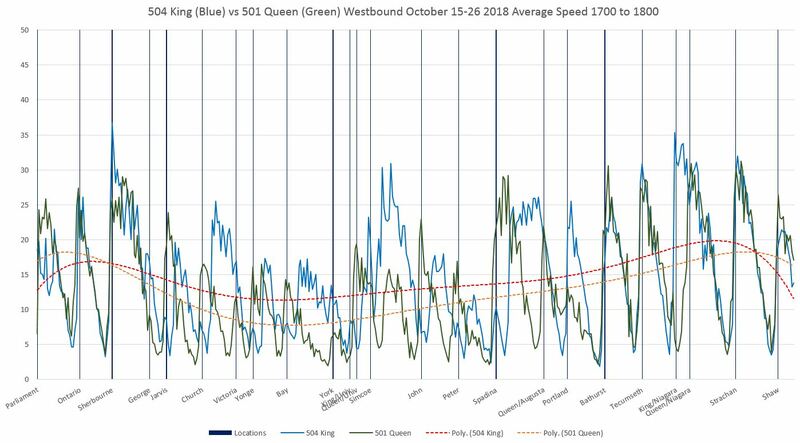 For a detailed review of headway changes on 504 King and 514 Cherry, please refer to Part II of the October update. 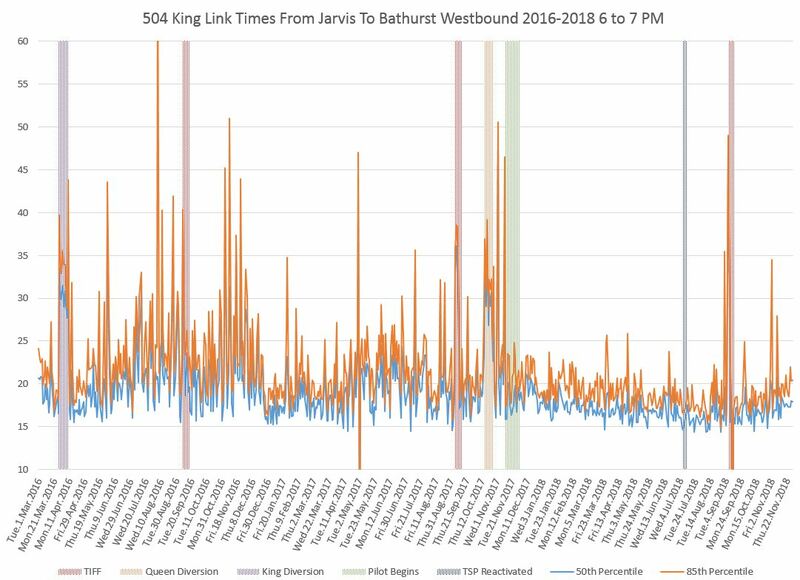 With the consolidation of the King and Cherry routes, the scheduled service on each of two branches is roughly the same. 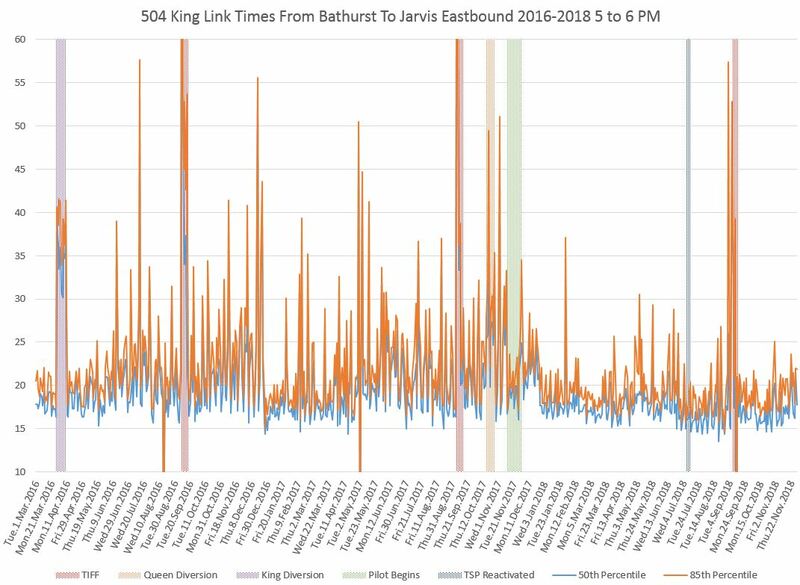 When these were separate, service on the Dufferin and Cherry spurs was worse than on the main King route, and service to the outer ends of the 504 at Dundas West and Broadview Stations was better. 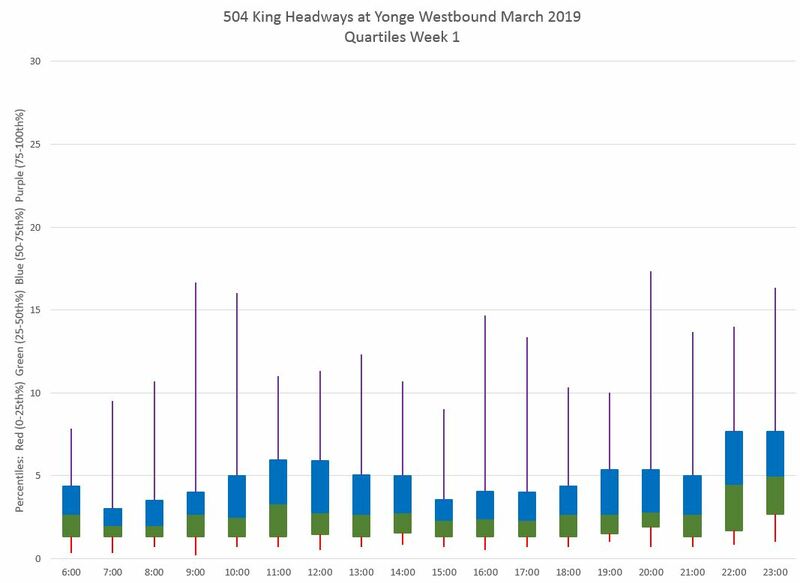 The revision has widened headways on the outer part of the route, but in a more troubling change, it has also widened the range of headways indicating that gapping and bunching now affect these areas to a greater degree. 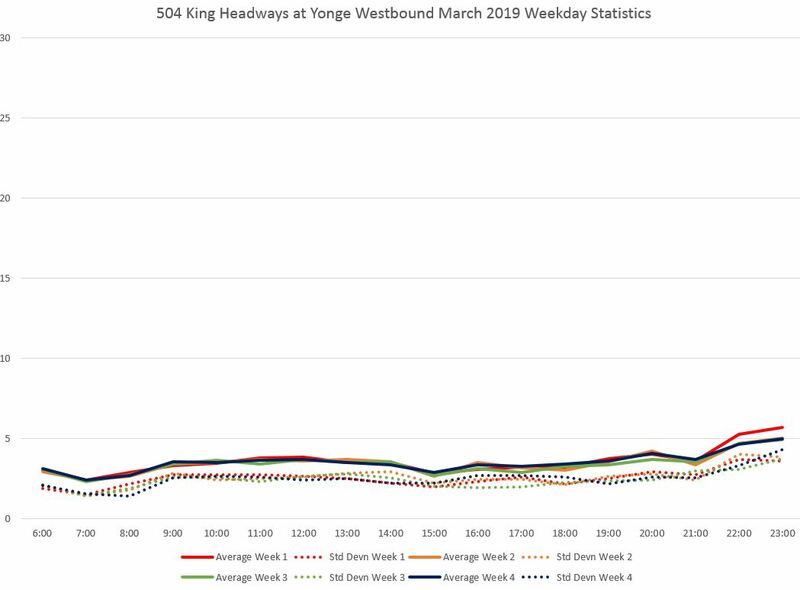 This is a fairly common effect on TTC routes when headways are widened. 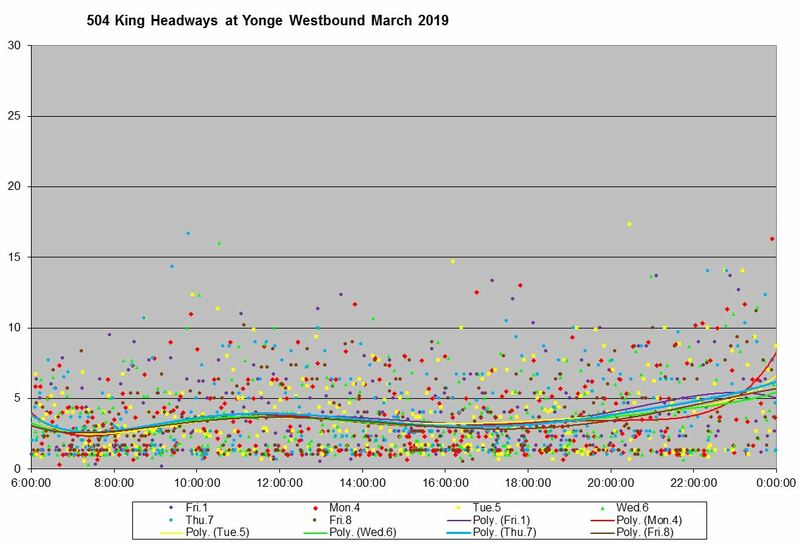 When headways are short, the gap between two cars running as a pair, or caused by a short turn, is not as noticeable to riders as the gap on a wider scheduled headway. 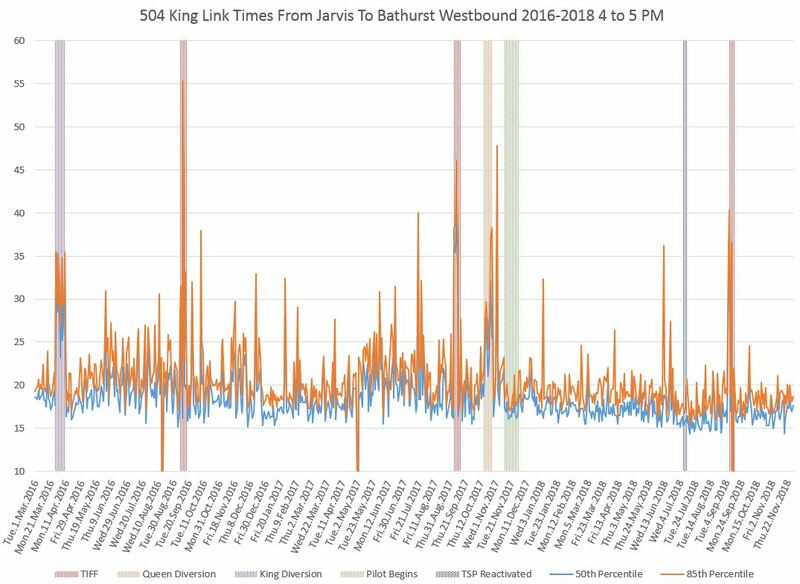 Line management tactics, including a laissez-faire approach, that might work on short headways compound the effect of wider headways. 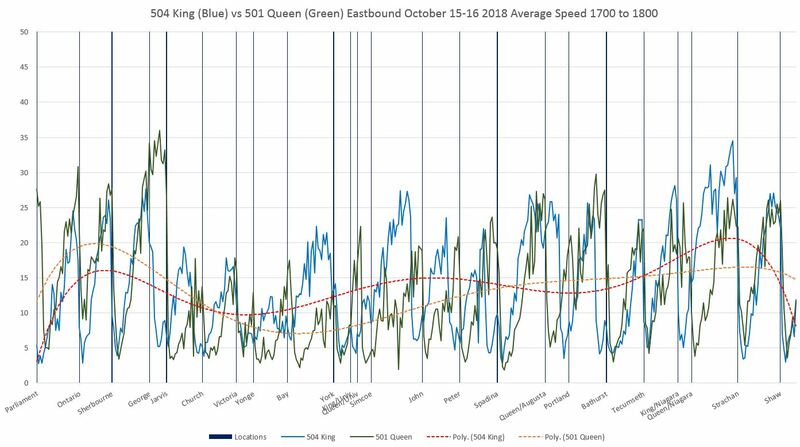 Although one might expect some unevenness in service heading outbound to terminals after crossing the city, there are also problems with reliability inbound indicating that service is not well regulated at terminals. 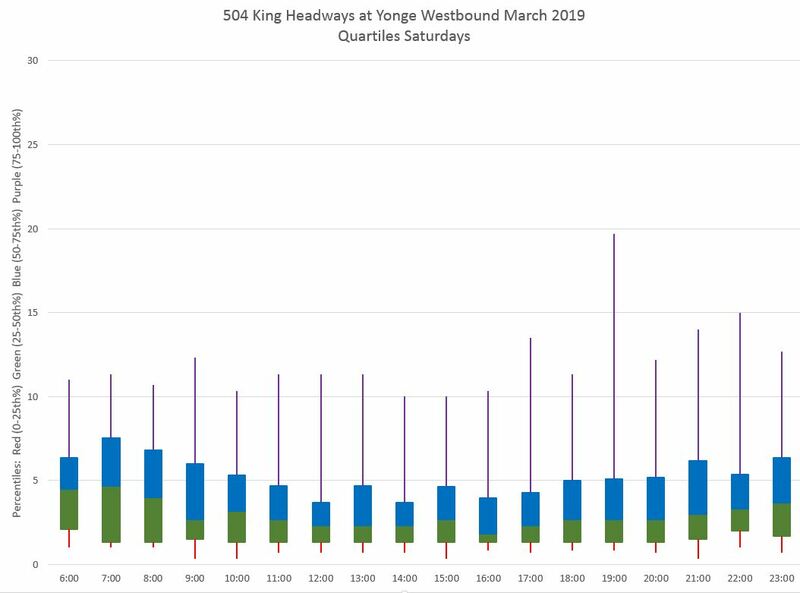 As I have written many times, the TTC Service Standards allow a generous variation in “on time” performance at terminals which allows pairs of streetcars to be considered within the target. 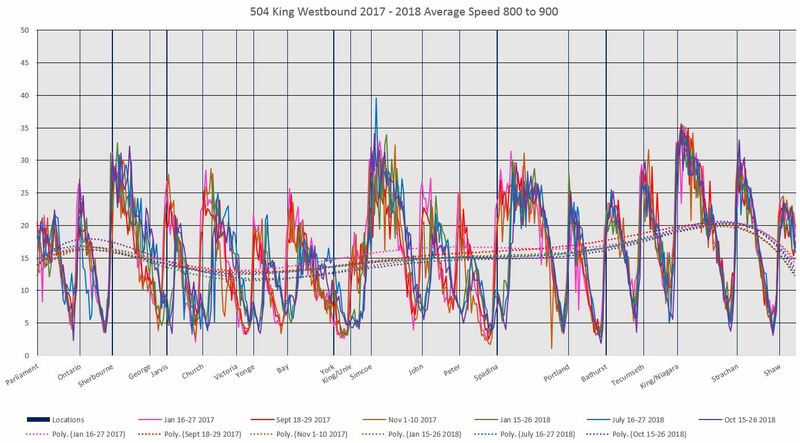 This allows management stats to look good while service to riders suffers. In the central part of the route, headways are short because two services overlap, and the spacing of streetcars is, to some degree, regulated by the combination of long cars, traffic signals and farside stop lengths. Only one car can serve a stop at a time leaving its follower on the nearside and likely held by the traffic signal. With shorter cars and nearside stops, it was common for pairs of cars to serve a stop at the same time and depart on the same signal cycle. 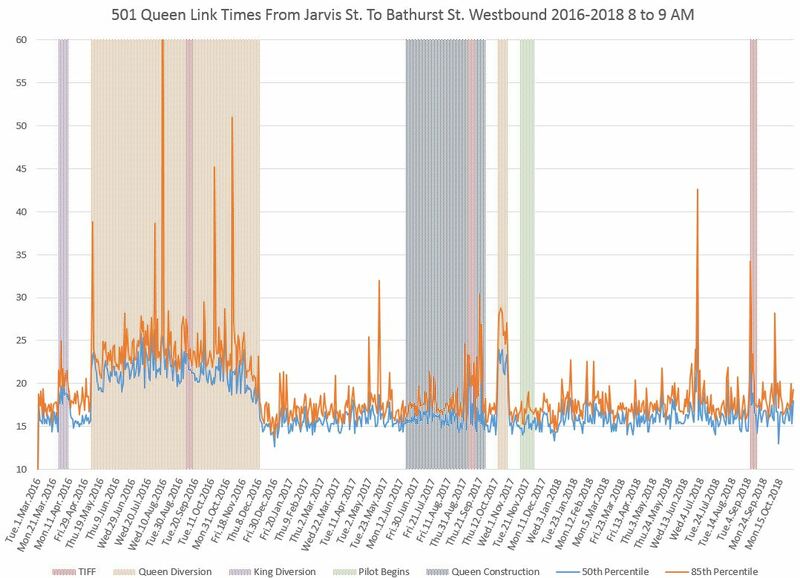 This is the last detailed review I will publish of the King Street pilot until March 2019 when the effects of route changes to take effect in mid-February will be visible. (All streetcar service will turn back at Dufferin for overhead and track reconstruction at Queen & Roncesvalles.) 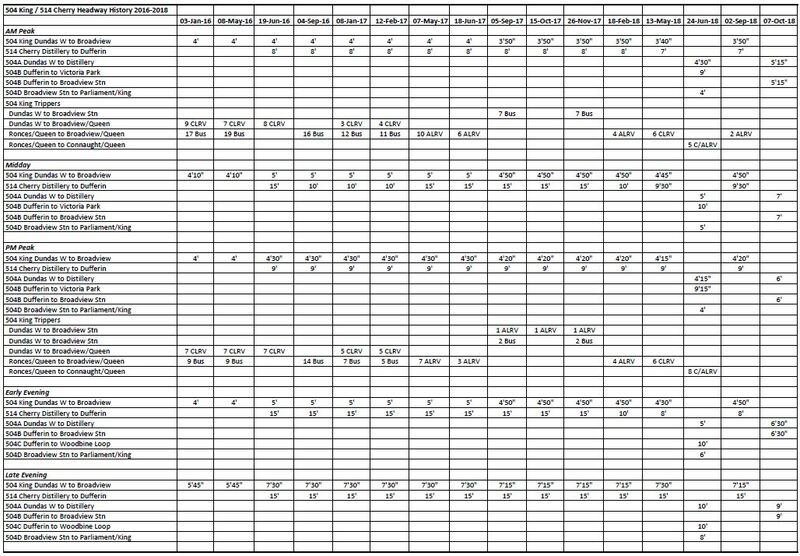 That update will include all data for December 2018 through February 2019 covering much of the winter period.